This past year I lost my dearest friend who was also my mother. The bad thing about aging is that you lose so many of those dear ones that you take for granted when you are young. Before my mother died, I had inherited a lot of costume jewelry. I created (the first painting of) The Family Jewels and began collecting more jewelry. I have jewelry from at least a dozen friends and relatives and I bought some on Ebay so, I may have jewelry from some of your friends and relatives. 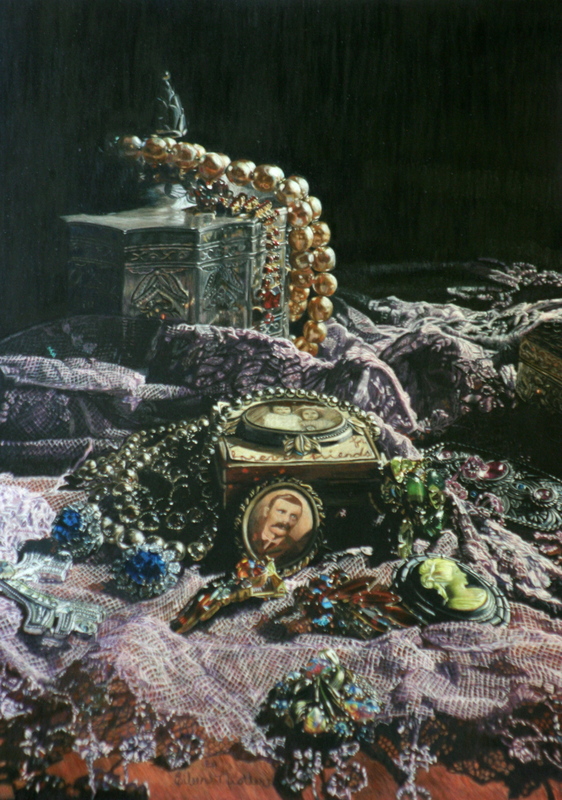 I of course got my mother's jewelry and a few of these pieces are in this painting. The Family Jewels will now be a series. As a child I used to love to play with jewelry. I remember playing with my grandmother's jewelry and feeling that I was a princess with a vast treasure trove of jewels. Some of these pieces I can remember exactly how they were worn by loved ones. I also have enjoyed delving into some of the flappers in the family tree. I look back at the style and times that these people lived through and how it is sort of represented by the jewelry they wore. The "jewels" are the lovely memories of people that I love and lives well lived.